New Delhi: Ford Motor Co will start production of a small car in India early next year, and its chief executive said the US market had was showing signs of recovery and he expected industry sales to rise in the next two years. The No. 2 US automaker is focusing on small cars, which it feels will increasingly drive sales, and chief executive Alan Mulally said the fast-growing Asia Pacific market will play a bigger role in Ford’s global sales. The company did not disclose the Figo’s price, but Mulally said Ford was not looking to directly compete with Tata Motor’s Nano, the world’s cheapest car at around $2,000 which hit Indian roads earlier this year. “Right now we are going to focus on the larger portion of the (small car) market, which is the B size. So, we don’t have plans to compete in the A size, or sub-B right now." 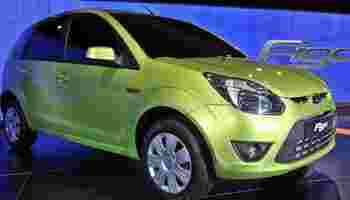 Ford will make the Figo at a plant in the southern Indian city of Chennai, which it plans to make a global production hub. The company is investing $500 million in the plant, which will have annual capacity of 200,000. India’s domestic auto market is relatively small, especially considering a population of more than 1.1 billion, with about 1.5 million passenger vehicles sold last year. It is however a fast-growing market, even in a global auto downturn. For the first four months of the 2009-10 fiscal year (April-March), domestic car sales rose nearly 10% from a year earlier. Small cars account of nearly two-thirds of annual sales. US auto sales fell to monthly rates not seen since the early 1980s earlier this year amid the recession, though some rebound was seen in July and August as the government’s “cash for clunkers" program supported demand. Mulally said there were signs of recovery and a sales pick-up was expected in coming years. Ford expects total US industry sales of about 11 million in 2009, rising to 12.5 million in 2010 and to about 14.5 million in 2011. “The fundamentals of economy coming back is the absolute key," Mulally said. “It’s a slower recovery and we think it’s going to go with the economy." Ford posted net losses totalling about $30 billion from 2006 through 2008. The only large US automaker not to reorganize in 2009 through a government-supported bankruptcy, Ford has said it expects to return to at least break-even in 2011. Ford has put its loss-making Swedish car brand Volvo up for sale. Mulally said it was still in talks with potential buyers, but did not answer a question whether they would be able to wrap up a deal this year. Last year, Ford sold its Jaguar and Land Rover brands to Tata Motors.